Ficosa, top-tier global provider devoted to the research, development, manufacturing and marketing of high-technology vision, safety, connectivity and efficiency systems for the automotive sector, is presenting its latest advanced communication solutions for vehicles at the 2018 ITS World Congress, which is taking place from September 17 to 21 in Copenhagen. At this edition, Ficosa is coming to the ITS alongside Panasonic at a booth that simulates the smart city CityNow that the Japanese company is developing in Denver (Colorado, United States) with the participation of Ficosa. This is the world´s largest smart city and it will be the first to deploy C-V2X (Cellular Vehicle-to-Everything) technology in the United States. As the main new addition, the event will see Ficosa present its CarCom technology platform. 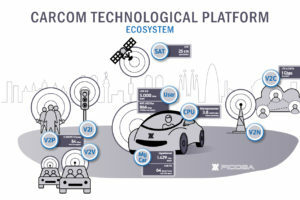 This pioneering development allows to integrate the different connectivity solutions in a modular manner in order to enable the vehicle to directly communicate with the new technologies that will define the future of mobility (Cellular-V2X, high-precision positioning, antennas with digital synchronisation, and also be ready to quickly introduce 5G technology). The Ficosa Antennas product range will also play a key role at the ITS with the company´s Flat Roof Antenna module, an innovative system that integrates multiple antennas, so they are not visible to the eye and without changing the vehicle´s aesthetics, since, thanks to its flat shape, it is built-in under the vehicle´s roof. Among the benefits offered by this device is the reduction of several antennas individually, mounting only one module, with the great benefit of reducing assembly cost and increasing performance. Also, Ficosa has released a digital catalogue for ITS with the connectivity product families and variants, to show attendants the solutions it’s developing within this field. The product variants on antennas, smart telematics, car-to-everything solutions, precise positioning systems and Cloud services are detailed into the five product lines that the company develops to improve the users’ safety and comfort as well as evolving towards the autonomous car. In recent years, Ficosa has made a great effort in terms of technology and innovation within the field of advanced communications in order to lead the race towards the car of the future. The company has focused a large part of its work on developing antenna systems and telematics modules, which enable internal and external connectivity and are crucial for both connected cars and autonomous driving. Given that technology increases the amount of information coming from the vehicle, users and surroundings, Ficosa´s solutions focus on safety and data protection.